The HX94A Series has been discontinued. 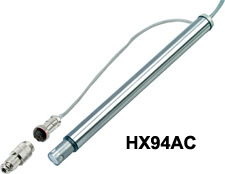 Please see the HX94 Series as a possible alternative or contact our Temperature Engineering department. The HX94A relative humidity/ temperature transmitter provides a reliable and low cost method for duct or wall mount monitoring applications. Solid state sensors provide excellent sensitivity, fast response, and stability. Simple hookup and linearized output permit interfacing with most display and control devices like meters, controllers, recorders, and data loggers. The design features a rugged stainless steel NEMA 4 (IP66) housing. 참고: Comes with 1m (3ft) cable (models HX94AC and HX94AV include connector pair), removable protective sensor filter, removable duct flange, wall mounting bracket, and operator’s manual.